Volunteer Leanne Wiberg has put in a lot of hours sewing scales onto the tarasque the last few days. She’s been keeping me up to date on the goings-on in the basement at the office, where this work is being done. 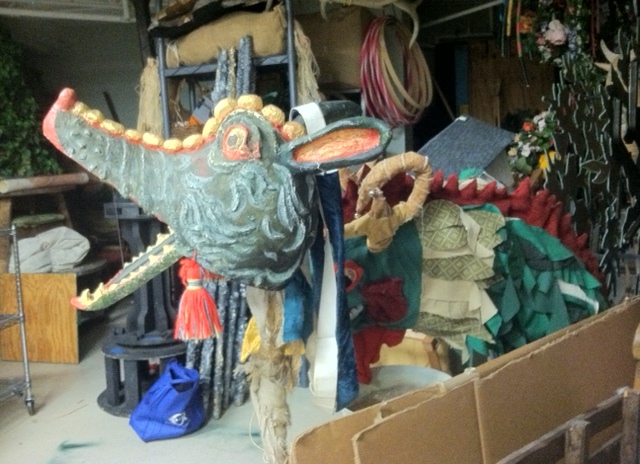 I have to share this picture Leanne took of Snap, a dragon puppet who has appeared on the Lisner stage many times. He lives in a prop storage area next to where the team is working on the tarasque. I particularly enjoyed Leanne’s caption.